Yet Another Burning Man Video. The blurb for this one says “Burning Man 2013”, but I see a Trojan Horse and a Temple from 2011, and an Anubis from 2012 in there…we’ll let it slide, and the CHEESY music…because there’s some nice photos here. Made me kinda homesick. Register now for a chance to buy your $650 tickets people! Your extra $270 over the standard price doesn’t go to the charity called the Burning Man Project, you don’t get a scarf or anything like that…but you can feel that you’ve done your part to “help out” this $30 million/year party by assisting the impecunious BMOrg increase their cas$h profit$. They need your help! P.S. Burning Man is not a party. Burning Man is not a festival. Burning Man is not a rave. Burning Man is not a photo shoot. 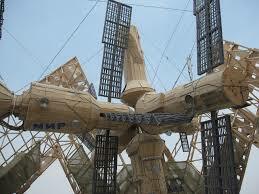 Burning Man is __________________ ?? ?